As you know, here at AROnline we are not adverse to scooping the odd story here and there. 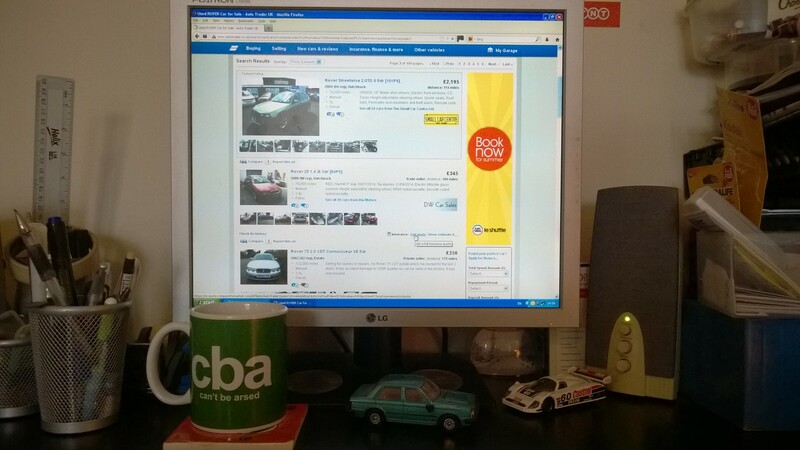 Readers will be aware that I am currently mid way through researching and writing a book about Leyland Trucks. The truck maker’s last roll of the dice, if you like, was the T45 range of commercials that spanned the 7.5 to 40 tonne market with the Roadtrain being the first of the range launched in 1980. 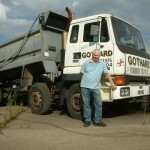 We ran a story a little while back about Tony Gothard who will feature in the book and still owns (in various states of condition) a sizeable fleet of Leyland Constructor tipper trucks in a small corner of Essex close to Tilbury. 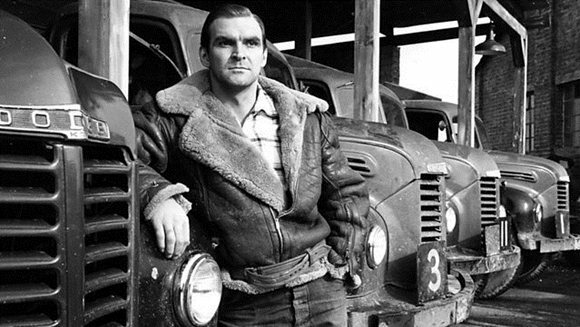 Well not only has one of the major truck magazines opted to feature this man, after asking me to write a small history feature about his lengthy Leyland loyalty, they are soon to feature in the big screen in a period re-work of the classic Cy Endfield film – Helldrivers that starred Sean Connery, Sid James, Stanley Baker, Patrick McGoohan and Herbert Lom. Tony called us to proudly mention that a well known American film production company, Golden Leaf Productions, has been in touch with Gothards with a view to them supplying as many roadgoing Leylands as possible for a re-make of that cult film that first saw the big screens back in 1957. Its all very early days, but it’s looking like Tony’s now redundant but reliable rubble luggers have incredibly stayed their execution once more… and it’s all thanks to AROnline, with the production company stumbling upon our features while researching for the film. The requirement is for 15 Leyland Constructors that will be cosmetically restored for filming purposes, and Tony mentioned their intentions are serious as they have already handed a deposit cheque over. Like we have mentioned, its all early days, and more information will be posted nearer the time. But one thing is certain – the production company has committed to Gothards and the project. Tony has already started getting restoration underway, and filming is scheduled to begin in 2016, once all the relevant permissions have been sought. Tony also mentioned that it was after viewing Helldrivers in a smoky London cinema in 1963 as a young man he then decided he wanted to be a tipper driver. Chuckling as he reminisced, ‘I wanted to be a kind of Patrick McGoohan Red One character just like in the film… who would have bloody thought 51 years later there was every chance I could be’. 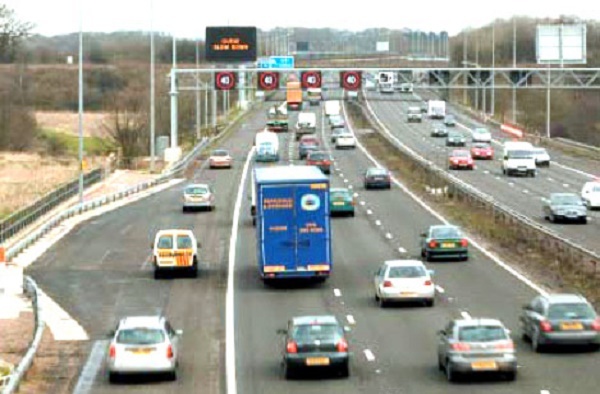 Set in the the late-’80s and early-’90s, the film will depict a time when many London hauliers were run by gangster type folk who would stop at nothing to protect their business, in days before the red tape world of today. But it gets better too… Tony asked me would I be interested in driving one of the vehicles in a extra role if need be. ‘Of course,’ came my reply. I knew my HGV licence would come in handy one day! Tony’s tippers have stayed an execution one more time thanks to the silver screen! 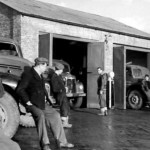 A scene from the 1957 film Hell Drivers – On the left Patrick McGoohan in the centre distance – Stanley Baker. This is the other licence you’ll need Mike! Fabulous news! Loved that movie & still have a dodgy VHS copy here. Great story, and that was one of my all time favourites alongside Spielberg’s first film, Duel. Mike, on a tangent: I don’t know if you have come across a haulage (?) firm called Barclay-Forrest in the eastern Scottish borders. They had a fleet of T45s in the eighties. 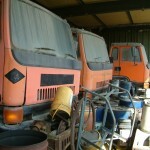 Point is, if you found any remnants of the firm – they had a really classy paint job on their trucks, good for photographs. I remember them so well. Not forgetting David McCallum. Great film. Several actors before they were famous in it. Wow, one of my favorite films! Great news! …..and also not forgetting Gordon Jackson! Yes. And I think Sean Connery was barely out of his pram when he was in this film (er…ok then early 20’s). He didn’t get top billing in the credits. He was near the bottom as a minor (and relatively unknown) actor. I checked on Wikipedia. He was 27. I think he barely got a line if I rerember. Need to dig out the DVD sometime. Any more news on this? I can’t find any reference to it anywhere else online. Odd that Chris I’ve heard of the company and spoken with them too. Still waiting to see any news of this film!